Constructed 1872-73 and enlarged 1890-73 (sic) and 1894, is a major monument to the art of cast-iron architecture. 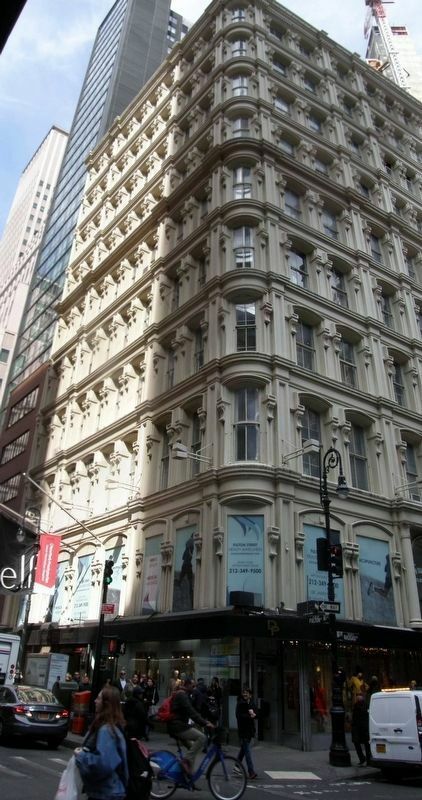 Ten stories high with three fully designed facades fronting Fulton, Nassau and Ann Streets, it has been described as the tallest habitable building with cast-iron facades ever built. Location. 40° 42.623′ N, 74° 0.469′ W. Marker is in New York, New York, in New York County. Marker is on Fulton Street near Nassau Street, on the right when traveling west. Touch for map. Marker is at or near this postal address: 139 Fulton Street, New York NY 10038, United States of America. Touch for directions. (about 400 feet away); a different marker also named St. Paul’s Chapel (was about 400 feet away but has been reported permanently removed. ). Touch for a list and map of all markers in New York. Regarding The Bennett Building. The building is listed in the "AIA (American Institute of Architects) Guide to New York City, Fifth Edition". More. 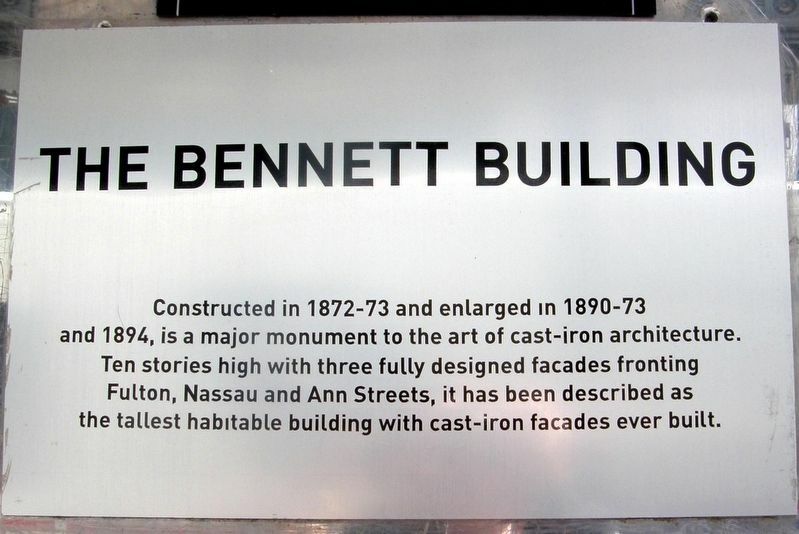 Search the internet for The Bennett Building. Credits. This page was last revised on March 29, 2019. This page originally submitted on March 27, 2019, by Larry Gertner of New York, New York. This page has been viewed 37 times since then. Photos: 1, 2. submitted on March 27, 2019, by Larry Gertner of New York, New York. • Bill Pfingsten was the editor who published this page.